First of all, 2099 will be adding YGOPro as another method of dueling with custom cards (But not removing Duel Portal from its use entirely). This new direction of 2099 is guided with a set of new members to assist with coding and is invited in response to Duel Portal's inconsistencies. As much as Duel Portal is enjoyable and all, I feel like it isn't something to 100% rely on, so this alternative option for dueling in the format is a great one as such. I look forward to using the system myself. In addition, Aslan (A user whom I have spoke recently in correlation with the recent changes) has also been speaking with the mods of DevPro with a shot of getting our cards hosted up there. I will say to not get your hopes all the way up, as we still have one person left to reach amongst the large amount of contacts Aslan has ran into, but communications have ended well for the most part. Regardless of what happens, we have an execution plan and it's one I am happy to see take action. Secondly, 2099's pack and submission system has changed quite a bit, to which can be look into here and here. 2099 runs now in a 12 week system, which results in us getting a new pack every week. Now when your generics are accepted, they will be posted in the Generic Submission Thread, and every 4 weeks, 100 of these will be accepted to arrive to 2099. In spite of these mostly being chosen by the Pack Managers of 2099, 10-20 (Depending on the number of votes in that set of 4 weeks) of these are up to the decision of you all. In between these, 2099 will also have TCG Import Packs and special packs dedicated to a specific theme (This time around, the Machine Type). These special packs are voted upon by the users, and whose feedback is moved then into the Card Request Thread, to which users can comment on the overall direction of the set or request up to 10 cards for the coming set(s). Votes and Requests for the sets up currently continue until Wednesday, April 6th, so get your voting up when you can. Negate the effects of all other Monsters in either player's possession during the Battle Phase. If this card destroys a monster by battle: You can detach 1 Xyz Material from this card and have it lose 1000 ATK until the end phase; This card can make a second attack in a row. If this card is in your graveyard: You can tribute 2 monsters you control; Special Summon this card during either player's Battle Phase. This card cannot attack directly if it is summoned this way, and it is banished when it leaves the field. 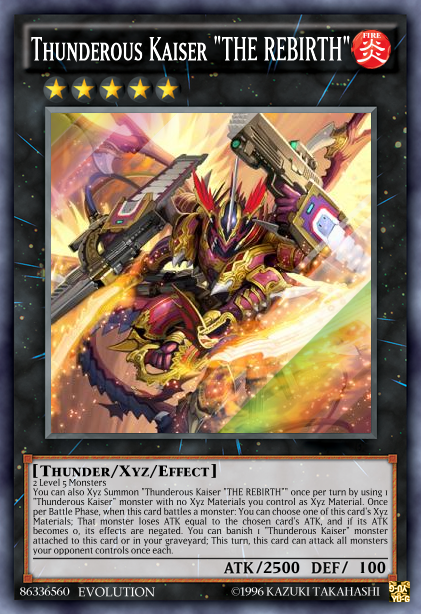 You can also Xyz Summon "Thunderous Kaiser "THE REBIRTH"" once per turn by using 1 "Thunderous Kaiser" monster with no Xyz Materials you control as Xyz Material. Once per Battle Phase, when this card battles a monster: You can choose one of this card's Xyz Materials; That monster loses ATK equal to the chosen card's ATK, and if its ATK becomes 0, its effects are negated. You can banish 1 "Thunderous Kaiser" monster attached to this card or in your graveyard; This turn, this card can attack all monsters your opponent controls once each. 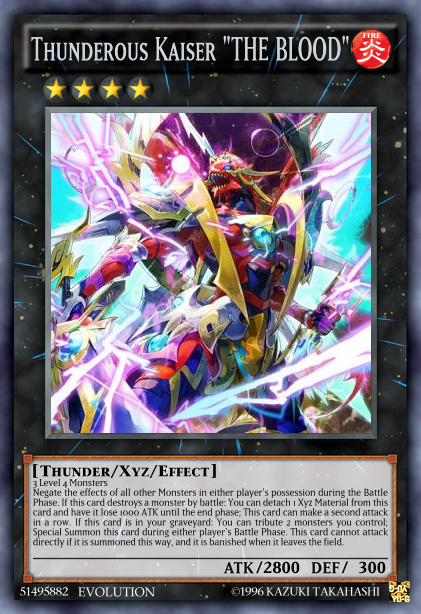 You can also Xyz Summon this card using a "Thunderous Kaiser" monster you control with 2 or more Xyz Materials as the Xyz Material. (Xyz Materials attached to that card are also attached to this card.) When this card battles, it is unaffected by other card effects until the end of the damage step. When this card attacks a monster: You can detach 2 Xyz Materials from this card and send 1 "Thunderous Kaiser" monster from your Extra Deck to the graveyard; This card gains 2500 ATK during damage calculation only. These 3 evolutions each have their own abilities and strengths, and as such their own unique way of obtaining them. Thunderous Kaiser "THE BLOOD" is obtained by having Thunderous Kaiser and a Rank-Across-Magic Spell Card at hand. In the Generic Submission thread, there is conveniently Rank-Across-Magic - Generation Stride, to which can be voted on to support THE BLOOD. Thunderous Kaiser "THE REBIRTH" is a similar deal, but his uses a Rank-Up-Magic Spell Card that can properly summon REBIRTH instead of a Rank Across. Another card to vote on in the set that could be a potential use for such is Rank-Up-Magic - Inferno Evolution, but other methods will definitely become available in the coming sets. Alas, Thunderous Kaiser "THE LIGHTNING" is not as easy as its 2 predecessors, to acquire it, you must obtain 3 Thunderous Xyz Monsters with different names. Where will you be able to find others alongside BLOOD, REBIRTH, and Kaiser itself? Well, the Divine Strike of the Draconic Thunder Structure Deck will be coming out April 24th, which will have the Blitz Dragon archetype that contributes Thunderous Xyz to its roster. 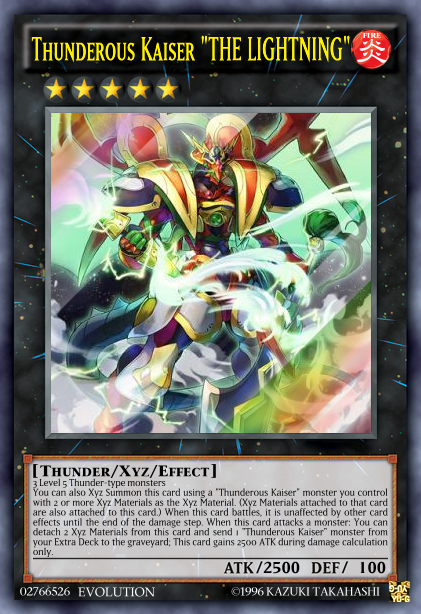 With all of these options and even one left unannounced, Thunderous Kaiser is bound to have an evolution to fit like a glove in the more dominant Xyz styles. And with that, I will wrap this up with a list of current dates and the way 2099's 12 Week cycle will be ran (Albeit it is subject to change). Any questions on any of this should be directly sent to me via PM on here or on Skype (My user is thedemoncommand). Happy 2099ing and I welcome your contributions in 2099's new format!